The Brooklyn Art Song Society is a unique treasure on the New York City musical scene. We have trekked to the farthest reaches of Brooklyn to hear their roster of splendid singers and to immerse ourselves in their innovative programming. We are pleased to report that BASS, has begun their seventh season in a new and permanent home--the Brooklyn Historical Society. We are even more pleased to report that the location is a grace note away from several subway stops and marvelously close to Manhattan. This season's ambitious undertaking has a theme--Wien: Fin de Siècle-- and comprises an exploration of that period of musical maximalism we call Late Romanticism. Our eyes love Klimt. Our ears love Mahler. The nine songs by Alexander Zemlinsky that we heard last night filled our heart with joy to the point of bursting. The opening event of the season was a benefit recital and the large space was packed. What a pleasure to see the results of Founder, Artistic Director and Collaborative Pianist Michael Brofman's consistently excellent programming. Preceding the recital was a lecture by NYU Professor of History Larry Wolff on the political and cultural environment in Vienna during this epoch. The aforementioned Zemlinsky songs were shared by soprano Kristina Bachrach and baritone Tobias Greenhalgh. Ms. Bachrach sings with a melting tone and a fine vibrato. She seemed to immerse herself in each song and drew the audience toward her. The songs are brief vignettes, mostly about love, with "Hütet euch!" bearing a shift from the lighthearted arrival of love to the warning about love's equally precipitous departure. The change in coloration was admirable. Mr. Greenhalgh has recently returned from the Wiener Kammeroper; although we had no complaints about his fine German diction before, we noticed a crispness that might have had us taking him for a native speaker. We particularly enjoyed the baritonal resonance of his instrument when he struck a lulling tone in "Schlaf nur ein!" The change of color from the anxious tone of the insomniac to the lulling reassurance at the end of each verse was quite lovely. We also loved the ardent romanticism of "Unter blühenden Bäumen". It was no fault of Mr. Greenhalgh that we could not relate to the lengthy and less accessible piece "An den Mond" by Hans Pfitzner. The text by Goethe is filled with troubled emotions; the vocal line is less melodic; the harmonies are more ambiguous. Mr. Brofman's piano captured the anxiety. The second half of the program comprised almost as much Strauss as we wanted to hear. The great thing about Strauss is that he is like champagne for the ear. One can imbibe to excess but one can never get enough! Miori Sugiyama took over for this set as collaborative pianist. 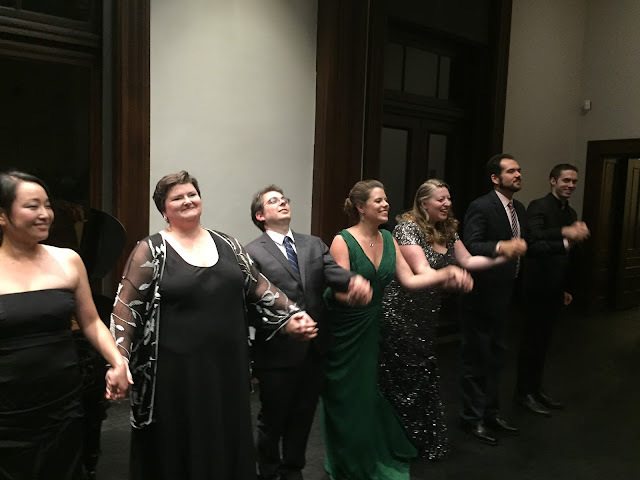 Soprano Laura Strickling has a warm stage presence and great ability to form a connection with the audience. Her German diction is a thing of beauty. Perhaps the charming "Ständchen" was our favorite in this set; the melody always accompanies us on our way home. We enjoyed her in storytelling mode when she gave a convincing performance of "Die Nacht", another melodic gem. Strauss is a perfect fit for her brilliant tone. She also sang Joseph Marx' "Selige Nacht". Every time we hear a Marx song we wonder why his songs appear so rarely in lieder recitals. Ms. Strickling captured the romantic mood and used superb dynamic control from the pianissimo beginning to the thrilling climax. Marx' "Nocturne" gave Ms. Sugiyama an opportunity to show off some dazzling runs on the keys. Tenor Dominic Armstrong used a gently caressing and tender tone for Strauss' "Heimliche Aufforderung" but became quite ardent at the end, pushing his tone a bit. We noticed this also in "Zueignung" when we wished he would float the top notes instead. One can be passionate at less volume! We were quite taken, however, by his performance of "Allerseelen", another favorite of ours. On this one day of the year, the poet (Hermann von Gilm zu Rosenegg) can reunite with the spirit of his loved one and Mr. Armstrong appeared to be seeing her spirit and, consequently, so did we. It was a powerful effect and an interpretation we will long recall. The final set on the program was the perfect conclusion. Soprano Tami Petty, first brought to our attention as a Joy of Singing winner, has a voice that is made for Strauss. She performed his autumnal Vier letzte Lieder and held the audience spellbound. Three of the texts are by Herman Hesse. The songs are said to be autobiographical, the summing up of the composer's life. "September" contains several melismatic passages that Ms. Petty made the most of, while "Beim schlafengehen" brought out all of Ms. Sugiyama's expressiveness. The two artists worked well together and the final piece "Im Abendrot" (text by von Eichendorff) was filled with ethereal ambiguity. The end of the recital? The end of Strauss' career? The end of his life? We heard five superb singers paying tribute to four fine composers. We eagerly await the next installment of Wien: Fin de Siècle on November 4th. "Wien II" will tackle the music of Hanns Eisler's Hollywood period. It will be a wonderful opportunity to hear another side of Ms. Bachrach's artistry and to reconnect with tenor Nils Neubert--yet another favorite singer of ours.